Former Sen. Claire McCaskill (D., Mo.) has joined MSNBC and NBC News as a political analyst. The network announced the new addition to its team during an interview with McCaskill on MSNBC's "Morning Joe" early Tuesday. 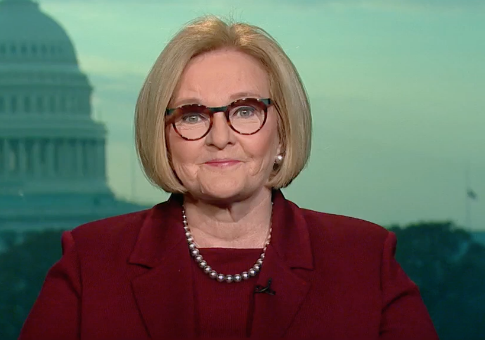 McCaskill, who lost her Senate seat to Republican challenger Josh Hawley back in November, released a statement expressing her excitement about being a political analyst on the networks, according to the Hill. "I’m looking forward to bringing my experience from the Senate, hard fought campaigns, and Midwest common sense to the coverage of breaking political events. And, as always, I won’t hold back," McCaskill said. "Morning Joe" co-host Mika Brzezinski quipped she looked forward to having McCaskill’s "really good, sharp elbows" at the table to fend off fellow host Joe Scarborough. The two-term senator and former ranking member of the Senate Homeland Security Committee also tweeted out a picture of her arriving at Manhattan's Rockefeller Center to report for her first day of work. McCaskill's new position will entail her providing political analysis on the two networks, including during MSNBC's coverage of President Donald Trump's State of the Union address on Jan. 29. She isn't the only former lawmaker to be hired at a news network in the aftermath of the 2018 elections. Former Sen. Heidi Heitkamp (D., N.D.), who lost to Republican challenger Kevin Cramer, is joining CNBC as a contributor. "Off to an interesting start! Looking forward to talking with you all as a @CNBC contributor," Heitkamp tweeted on Tuesday. Former Ohio Gov. John Kasich (R.) announced on Twitter Tuesday that he would be joining CNN as a "regular contributor." This entry was posted in Politics and tagged 2018 Election, Claire McCaskill, Heidi Heitkamp, John Kasich, MSNBC, NBC. Bookmark the permalink.